than most dogs could handle. Luckily, Pablo is not most dogs. He has such a great attitude, despite having to endure a lifetime of disappointments. Though he has a bit of a limp and might be slightly past his prime, Pablo is always happy. With a wagging tale, a kiss for anyone who is interested and a resilience that is both uplifting and heartbreaking Pablo is what rescue is all about. He's good with other dogs and he loves people. He doesn't need a lot of exercise and would be happy on a nice soft doggy bed in your home. He appears to be a Bull-Terrier mix and given some TLC he'll get back much of his model looks! 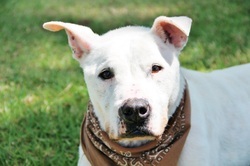 If you have some room in your heart for Pablo, this old boy will become a pup, once again! SAR's Pablo gets a new ride from SACHI Animal Rescue on Vimeo.